Learning to appreciate your patients is critical to the success of any practice. It is equally important to show appreciation for your staff. And, with this, comes some painful situations. Unfortunately, part of having employees also includes the possibility of letting someone go. If you do this right, it can make a big difference in the workplace. There are many reasons people need to be let go. 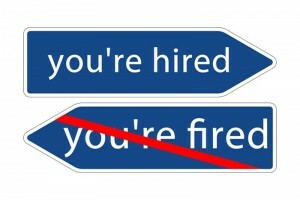 Here’s how to handle layoffs, terminations and letting go of staff the right way. Every practice has a culture, whether you know it or not. It’s what you determine is most important and fixed in the practice. When someone is employed who doesn’t fit into your culture, be willing to let them go elsewhere. There’s no need to discredit them, or act like they’ll never be able to find success in someone else’s business. But put a great worker in a wrong culture and even they can go downhill fast. This is when you hire the wrong person. They are a big mistake on the part of the recruitment team. Whether someone forged their resume and knows how to play a role really well or maybe the team members interviewing wanted someone to fit a role so much they completely overlooked the warning signs. Whatever reason, someone who shouldn’t got into your practice. It should NOT happen and it will cost you money when it does. Make the exit as quick and painless as possible. No need to be degrading, intimidating or horrible about it. This is when you hire an employee or contractor who cannot fulfil their assigned tasks and you both know it. They’ve been with you for quite some time and for whatever reason, they’re sinking fast. The important thing is to remember that everyone has their issues, but there comes a time when disciplinary actions must be taken. If someone lies about their hours, spends work time on their iPhone, comes into work intoxicated or whatever it is, you can’t let a culture become poisoned with repeated actions that aren’t being corrected. Termination does happen. Make it kind. Even if you have to walk someone out of the building, do it with the least amount of emotion possible. Then, go spend time with your team. Encourage the other team members. Attitudes are more contagious than anything, so be careful what you are passing around the office. It is important to remember that your staff cares about their life, their pay and their family more than they care about your practice. Don’t expect them to have your burden for profits, plans and marketing challenges. If you have to let someone go, do everything you can to make the transition as smooth as possible. If it’s in the budget, help out them out for a week or two. The best exit strategy is professional and fair. The team structure may at first suffer when you have to let someone go. But even if a team member is upset or hurt by the dismissal, everyone will benefit long-term. Don’t be afraid to show you care. It matters.